Toshiba's refresh of its Satellite laptop range sees the company try and please everybody. Using Intel's new Core i3 and i5 chips to full effect, Toshiba has added three new models to its laptop range – the Satellite L670, L650 and C650. For those who are counting the pennies (and who isn't at the moment? ), the C650 range is branded as 'the most affordable' option, with prices starting from £400. The laptop isn't the nicest thing to look at. It's packing some bulk on the chassis and it doesn't have a gloss finish like it's more expensive stable mates, but Toshiba certainly haven't scrimped on what features it is offering. These include the company's own software that's been designed to make your computer life that little bit easier including a Bulletin Board, which can also be found on the NB305 netbook range. Even though the 15-inch C650 is budget friendly, it includes a nice chunk of pre-installed software from Nero – for all your burning desires – and an iPlayer desktop icon for those who want to stream. The whole thing is powered by a Core i3 chip and is running Windows 7 Home Premium. Connectivity for the C650 leaves you a touch wanting. There's a card reader on board, Wi-Fi but only two USB 2.0 ports. 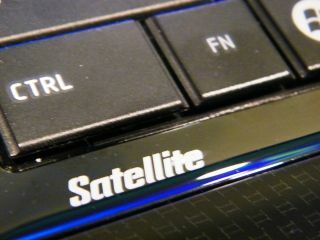 Interestingly, there is a numerical keypad on all the new Satellite ranges, something which had started disappear from most laptops. If you fancy splashing out a bit, then the L650 and L670. Both models have the same specs appeal, but the L650 has a 15.6-inch screen and the L670 hosts a 17.3-inch screen. Both are LED backlit and impressive to look at. Design-wise, they have a gloss-black chassis and are bulky looking beasts. They are being pitched as desktop replacements and it shows. You have more chance of Paris Hilton sitting easy in your lap than these devices. With the bulk come lots of features, including 500GB HDD storage space, up to 4GB of DDR3 RAM, integrated web cam with facial recognition and DVD drives. You can also opt to upgrade to Blu-ray. Like the A660, there are a number of streaming options including DLNA compatibility and a pre-installed iPlayer app is also on board. DVD Burning giants Nero also pop again with the company's software installed for all your burning needs. The Satellite L650, L670 and C650 have a UK release date of My, with official pricing to be announced.